In collaboration with the wastewater associations, INDA is committed to giving consumers the information they need to make wise choices. We believe consumers will make the right choice when they know what the right choice is. There has been a lot of publicity recently that wastewater facilities are encountering a high level of debris in their collection systems that should not have been flushed down toilets. The removal and disposal of this debris consumes resources that could be deployed in other important areas. Wipes that have been flushed are a significant portion of this debris, with paper towels and feminine hygiene products also contributing to the problem. But only wipes have a small portion of products that are designed and marketed as "flushable." And this small category of the overall wipes industry has received a lot of misdirected attention—attention that should be focused on the items that make up over 90 percent of collected wastewater debris. In this article, I will attempt to provide some clarity on this important issue being confronted by wastewater operators and explain how the nonwovens industry is addressing this issue with industry members and consumers. By understanding the source of the problem--the inappropriate flushing of items not designed to be flushed—INDA's hope is that we can work together with the wastewater community toward an effective and long-term solution. We can all agree that, just because some things can be flushed down a toilet (such as paper towels, many wipes, and even golf balls) does not mean that they are designed to be safe in the wastewater system, or therefore are flush-friendly. We need to focus "Do Not Flush" efforts on the right targets, the items never designed to be flushed, and not that small category of wipes engineered to disintegrate in the wastewater treatment system. I represent INDA, the Association of the Nonwoven Fabrics Industry, a $30 billion global industry whose end-products include diapers, all kinds of wipes, insulation materials and filters, among others, and whose membership is comprised of companies such as Proctor & Gamble, Kimberly-Clark, and Georgia-Pacific. We agree that there's a problem: We need to stop flushing items not designed to be flushed. In the wipes category, 93 percent of wipes sold are not designed to be flushed, not marketed to be flushed, and contain disposal instructions to not flush. These non-flushables include baby wipes, hard-surface cleaning wipes, anti-bacterial wipes, facial wipes, and many other kinds of wipes. Only 7 percent of wipes are specifically designed to cause no harm to wastewater systems and are therefore marketed as a flushable supplement to toilet paper in the cleansing process. Consumers have found that this product meets a need for enhanced cleanliness, and its use has grown. These particular wipes are highly engineered items made largely of natural cellulosic fibers that are much shorter in length than fibers in other wipes. These short-fiber wipes hold together to get their job done and then lose their integrity when flushed and conveyed through the wastewater system, becoming totally unrecognizable from toilet paper debris in their final state. And flushable wipes undergo a rigorous Flushability Assessment Testing process to substantiate these properties and the industry's "flushable" designation (see INDA.org/flushability). In studies of the components of debris collected on wastewater screens, paper towels consistently made up the largest portion of the debris, accounting for almost 50 percent. Paper towels should not be flushed, nor are they marketed as flushable. Similarly, baby wipes (not designed to be flushed, but rolled up in a diaper and discarded in the trash) comprised about 20 percent of the debris clogging sewers. Then came feminine hygiene products (again, not designed to be flushed), then household and personal care wipes (also not designed to be flushed). Items that could be identified as flushable wipes accounted for only 8 percent of the debris collected, and even that is primarily due to the accumulation effect taking place once a blockage has started. Even pieces of toilet paper can be found on that blockage. These numbers speak for themselves, they are the result of studies INDA has conducted with U.S. wastewater sector representatives, in an effort to understand the problem and possible solutions. While media coverage of "fatbergs" and municipal clogs has increased in the past year, this is not a new issue—for the wastewater sector or for INDA. In fact, our dialogue with the wastewater sector began in 2003 and stepped up in 2012 with the major wastewater associations (NACWA, WEF, APWA, and CWWA) to focus the public's attention on properly disposing of, or not flushing, the 90+ percent of items that are really causing the clogs in wastewater systems. Together, we are also working to further strengthen the Flushability Assessment Testing that products must pass in order to qualify as "flushable" and be marketed as such. INDA and wastewater have come a long way in educating each other and working toward a solution. While there is more to be done, we firmly believe that that the best and most effective solution will require the joint efforts of INDA, consumers, manufacturers, brand owners, wastewater entities, and communities to reach our common goal: create awareness about safe disposal of products used in a bathroom and spread the message that the toilet is not a trash can. In collaboration with the wastewater associations, INDA is committed to giving consumers the information they need to make wise choices. We believe consumers will make the right choice when they know what the right choice is. 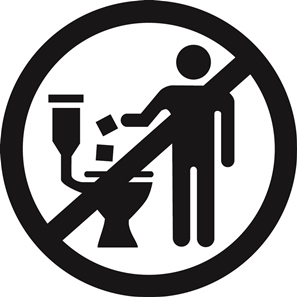 Our industry has accepted the responsibility to do more to make the "Do Not Flush" symbol more prominent on packaging, and we are supportive of increased consumer education about what should and should not be flushed. We welcome all who are willing to work with us on these important issues. We are all in this together, and the wipes industry is willing to do our share. Dave Rousse (drousse@inda.org) is the president of INDA, the Association of the Nonwoven Fabrics Industry.